I’m glued to my video stream – as are many of you, I’m sure – as events in Boston unfold. I can’t help but remember back to 9/11, when the source of ongoing news was the television. I’m not one to watch the same coverage over and over and over. I also tend not to watch most unfolding news coverage because frankly, I don’t think most of what is shared is information that should be shared. My concern is that it provides “tips and tricks” for those who are intent on causing harm while giving me information I simply don’t need. Maybe it’s because Boston is in a part of the country I know well. Maybe it’s because it is such a horrific story. Maybe it’s because it is all unfolding in real time. Whatever the reason, it’s a story I want to follow. It’s also a story that has made extraordinary use of social and digital media. From smart phone footage to Twitter tweets, streaming video, and text message alerts, the events of this week have unfolded in a way that can be followed independent of a conventional television set. I think the thing that strikes me about the coverage of the Boston bombing is what a good job the various news sources are doing of providing the news without engaging in the sort of hysterical hype that the threat of a single snowflake generally engenders. I’ve actually learned something through their coverage. It’s clear they are working hard to be accurate, to work together, and to not “hype” the story. Clearly, conventional sources of news coverage can’t keep up with the breaking nature of this news. Unless newspapers print hourly special editions, they are necessarily behind the curve, but they can provide a thorough timeline and more detailed information of the story and the background. I’ll be interested to see how that is done – as well as what Time and other news magazines do with this story. As a writer and sometimes journalist, it’s been fascinating to observe. Maybe we’re even witnessing the beginning of a new hierarchy of coverage – one in which all the news sources have a role. The police response has also been amazing from what I can tell. I hope what we’re seeing is the result of the changes and drills that have taken place since 9/11. So many people have come together in a coordinated effort – first to help the injured, then to identify the perpetrators, then to capture those perpetrators – that it leaves me feeling more secure than I have in many years. Between threats from North Korea, Ricin in the mail down here, and bombings in Boston, it would be easy to throw up our hands and wonder how we exist at all. Yet the reaction seems to be just the opposite. The reaction seems to be that we are here and we’re going to tackle each threat in turn. How about you? What has your experience been? 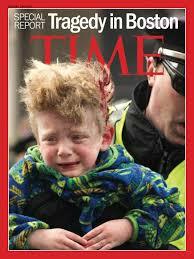 Categories: Blog, News, Social Media | Tags: Boston Bombings, New Coverage, Social Media, Streaming Video | Permalink.